Reading list on iPhone is undoubtedly an incredible feature. For those who are not aware of reading list, it is simply an added functionality in Safari that allows you to bookmark a particular page that you may want to read in future. Essentially, Safari saves the page for you to read later on. However, unlike the bookmark facility, you can delete these saved pages once you have read it. After all, it does not make sense to have pages that you have already read take up extra space in your memory. As such, deleting these lists can be quite beneficial in terms of releasing storage space and improving your phone’s performance. Clearing safari offline reading cache is necessary, because it helps in saving storage and Safari does not remove items from the reading list automatically. 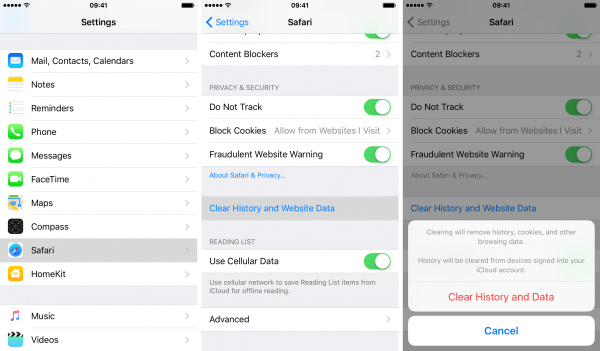 To clear safari offline reading list cache, follow the steps below. Enter Settings > General > Storage & iCloud Usage > Manage Storage. A pop-up list appears. Choose Safari from the list. Click on Edit at the top right corner. Tap the red Delete button and hit Delete again to confirm. This process will clear safari offline reading list cache. 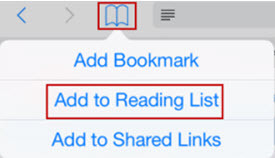 If you do not have too many reading lists, then you can delete Safari reading list on iPhone one by one. It's easy to do that, you just need to select the reading list that you want to remove, then swipe left, and the option of "Delete" will appear, tap on it to delete the reading list. You can also delete all Safari items at once on your iPhone. The following steps are applicable. Go to Settings on your iPhone and then Safari, you will see "Clear History and Website Data" option there. Choose the option and then hit "Clear History and Data" to confirm. 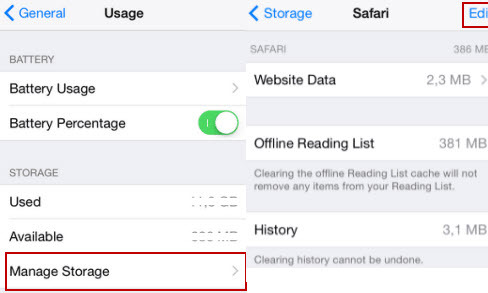 Kindly note that, you must enable iCloud and Safari backup to iPhone and iCloud respectively, but must turn it off immediately in order to see the option of clearing all Safari data on iPhone. Clearing Safari Offline Reading List cache will not remove some important items from the reading list. However, it will not delete all unnecessary junk files. To remove all iPhone junk files, try the FREE trial version of iMyFone Umate Pro, it's free but effective. Clear History and Website Data will help you to remove all cookies, history and temp data on Safari, which will also delete some important data or files. 3. How to Permanently Delete iPhone Reading Lists, Making Them Unrecoverable! There are hardly any apps that let you delete files that can be categorized as private. Reading lists, although not sensitive, are still a type of private information that must be prevented from getting into the wrong hands. In fact, it is very crucial to delete such private files from time to time in order to make sure your privacy is protected. With the increasing pace at which technology is advancing, so are cybercrimes. They have become ever more commonplace and it is not uncommon to have privacy breaches. iMyFone iPhone Eraser / iMyFone iPhone Eraser for Mac can help you remove such private files completely without any possibility of recovery. With its “Erase” feature, you can easily preview and select the files that you think are private to be totally wiped. Erase deleted files: Detect the deleted files and permanently erase them to avoid privacy leak. 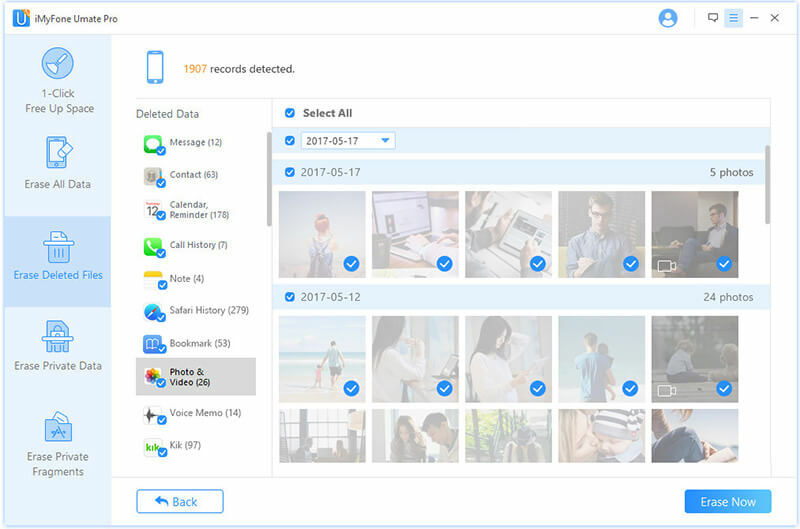 Erase private data: Erase permanently sensitive messages, notes, photos, videos, even WhatsApp data, the erased data cannot recovered by any data recovery software, so your privacy will be completely secure. Erase 3rd-Party Apps Traces: All private fragments or leftover by Snapchat, Facebook, Twitter, Chrome, Instagram and more apps will be completely removed from iPhone. Umate Pro is fully compatible with iOS 12/11/10/9 and is highly spoken of by lots of well-known media, like macworld.co.uk, Makeuseof.com , Cultofmac.com, iPhoneinCanada etc. Step 1: Connect your iPhone to the computer where you installed the software. Step 2: Choose the "Erase Deleted Data" mode and hit "Scan" button. When it finishes, you will see the complete analysis result of your iPhone. Step 3: Hit "Erase" button of the specific item you want to clear and it will start cleaning. Remove junk & temporary files: Clear up useless junk and temporary files to free up iPhone storage and booster up iPhone. These files include app caches, cookies, crash logs, user storage files, corrupted files etc. Compress photos: The photo compression can reclaim 75% of your photo storage. Mass deletion: Mass delete multiple photos/videos/Apps to save huge iPhone space. Auto backup: Back up automatically the original photos and videos on PC before compression and deletion. For people who do not have enough time to read some useful articles on Safari on their iPhone, it is possible to add the links and websites to the reading list in order to read them at sometime later. The following is a step by step guide on how to achieve this purpose. Step 1: Open “Safari” on the home screen. Step 2: Open the website that contains the useful articles. Step 3: Tap “Bookmark” and tap “Add to Reading List”. Note: You can also add links and websites to reading list through the use of share icon or via the link itself. Whichever way you choose, you can easily add those important links to your reading list on your iPhone.